Cover baking sheet with foil; spray with cooking spray. Microwave white candy coating wafers in microwaveable bowl on HIGH 1 min. ; stir until smooth. Combine popcorn and NILLA Wafers in large bowl. Add half the melted candy wafers; toss until popcorn and NILLA Wafers are evenly coated. Add remaining melted wafers and chopped candy canes; mix lightly. Spread onto prepared baking sheet. Microwave red candy coating wafers in small microwaveable bowl on HIGH 45 sec. ; stir until smooth. Drizzle over popcorn mixture. Refrigerate 5 min. Break into bite-size pieces.il firm. Substitute 2 pkg. (4 oz. each) white baking chocolate for the white candy coating wafers. Substitute Don’t have an air popcorn popper? 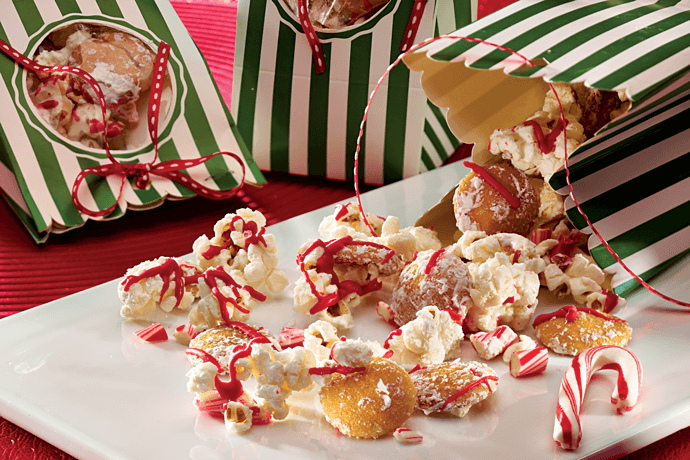 You can instead prepare this fun snack using your favorite plain popped popcorn. Substitute Prepare using coarsely crushed starlight mints.